The demand in the global remote mobile payment market is projected to escalate an exponential CAGR of 44.9% during the forecast period of 2017 to 2022, gaining traction from a number of factors such as ubiquity of smartphones, technological advancements that have enabled instantaneous authentication of personals, and growing fields of Big Data and the internet of things. The advent of near field communication (NFC) technology is likely to have an impressive future in e-commerce as well as retail shops. Though the remote mobile payment market is still in nascent stage and data security remains the most glaring restraint, the future seems highly prosperous, with the opportunities exceeding a global worth of 7,526,127.9 mn by 2022, rapidly mounting from its evaluated worth of US1,176,712.6 mn in 2017. Based on mode of payment, the global remote mobile payment market has been segmented into peer-to-peer and m-commerce. In 2017, m-commerce accounted for 89.9% of the overall demand, which was worth US$1,058,366.1 mn. By the end of 2022, this segment is expected to remain the leader, serving 94.0% of the total demand in the global remote mobile payment market, which will be of valuation US$7,070,810.1 mn. Revenue in this segment is growing at US$1,202,488.8 mn over the course of the forecast period, and this absolute growth is larger than any other segment. On the basis of end-use industry, the market for remote mobile payment has been bifurcated into retail, hospitality and tourism, IT and telecommunication, banking, financial services, and insurance (BFSI), media and entertainment, airline, and healthcare. Nearly all of these sectors have high hopes from the remote mobile payment market. For instance, the media and entertainment industry has been marred by piracy for a long time, and are now adopting remote mobile payment methods to make up on a lot of lost revenue. Device-wise, the remote mobile payment market has been categorized into smart devices and feature phones. Among all geographical regions, the North America remote mobile payment market is most lucrative, owing to high adoptability rate of new technology among the citizens of the developed countries of the U.S. and Canada, ubiquity of smartphones, and existing penetration of e-commerce. Evaluated to be worth US$264.646.3 mn in 2017, the North America remote mobile payment market is estimated to reach a valuation of 1,900,332.8 mn by 2022, incrementing the demand at an above-average CAGR of 48.3% during the forecast period of 2017 to 2022. Although Europe currently is the second most profitable region, promising an absolute dollar opportunity of US$1,052,187.8 mn by the end of 2022, the region of Asia Pacific except Japan (APEJ) is projected to overtake and reach a worth of US$1,511,056.3 mn by 2022. This surge of demand in the APEJ remote mobile payment market is a reflection of vast population of two of the fastest growing economies in China and India. Smartphones are reaching to general audiences at a rapid rate and even the government in these two countries are pushing for cashless processes in order to keep track of the transactions. By the end of 2022, Japan remote mobile payment market is projected to reach US$ 587,635.8 mn, expanding at a CAGR of 39.2% over the forecast period. Some of the key players currently holding position of strength in the global remote mobile payment market are: Samsung Electronics Co Ltd., Apple Inc., ACI Worldwide, Inc., Alphabet Inc., DH Corporation, Visa Inc., Square, Inc., Mastercard Incorporated., PayPal Holdings, Inc., Fidelity National Information Services, Inc., and Fiserv, Inc. Most of these companies are working on the robustness of the process and aggressive market in order to differentiate themselves from the competitors. This report on the global mobile payment market aspires to serve as a reliable tool to aid to the business decisions of targeted audiences. As the market for remote mobile payment market in its nascent stage, the research analysts of this report have given special care to the rapid technological advancements. Built by a group of professional market research analysts, this report evaluates, estimates, and forecasts the future of the remote mobile payment market on the global, regional, and country levels. The study supplies forecast between 2017 and 2022 and comprises an exhaustive analysis of the value chain for each of the segments, divided on the basis of mode of payment, end user, devices, and region. This report on the global remote mobile payment market contains a comprehensive view of the market. 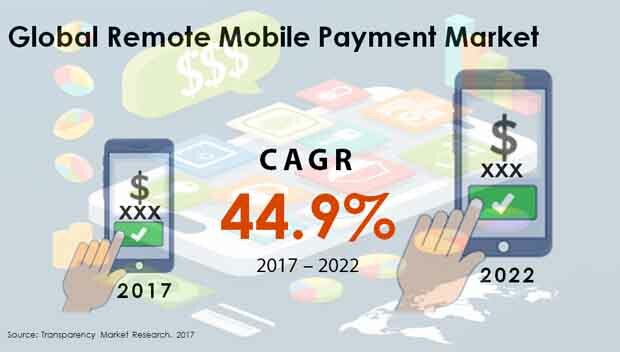 The study includes factors that will act as drivers and restraints for the remote mobile payment market along with their impact on demand during the forecast period. The report is backed by a qualitative representation on market attractiveness analysis, wherein every single segment has been explored based on attractiveness for each region. Growth rate, profit margin, market size, competition, impact strength, technology, and other factors (such as legal) have been evaluated in order to derive the general attractiveness of the market. Based on mode of payment, the global remote mobile payment market has been segmented into peer-to-peer and m-commerce. In 2017, m-commerce accounted for 89.9% of the overall demand, which was worth US$1,058,366.1 mn. On the basis of end-use industry, the market for remote mobile payment has been bifurcated into hospitality and tourism, retail, IT and telecommunication, media and entertainment, banking, financial services, and insurance (BFSI), airline, and healthcare. On the basis of device, the remote mobile payment market has been categorized into smart devices and feature phones. Geographically, the report takes stock of the potential of remote mobile payment market in the regions of North America including the U.S. and Canada, Latin America including Mexico, Brazil, and Argentina, Europe including the U.K., Germany, France, Italy, Spain, and Nordic, Asia Pacific except Japan (APEJ) including India, China, Thailand, Malaysia, Singapore, and Australia, and the Middle East and Africa including Gulf Cooperation Council (GCC), South Africa, Israel, and Nigeria. For each of these regions, this report on the global remote mobile payment market provides revenue comparison on the basis of mode of payment, end-use industry, and devices. To compile this business tool, in-depth interviews and discussions were conducted with a wide range of key opinion leaders and industry participants. Primary research included the bulk of research efforts, complimented by extensive secondary research. Key players’ product literature, annual reports, press releases, and relevant documents were reviewed for competitive analysis and market understanding. This process helped in authenticating and providing strength to the secondary research findings, whereas the primary research aided in the development of the analysis team’s expertise and market understanding. Secondary research sources that were frequently referred to by the researchers include, but were not limited to, company’s financial reports, official websites, annual reports, broker reports, investor presentations, and SEC filings. Other sources such as market reports, internal and external proprietary databases, databases of statistics, national government documents, news articles, and webcasts specific to companies operating in the remote mobile payment market have also been referred for the report. Apple Inc., Alphabet Inc., Samsung Electronics Co Ltd., DH Corporation, Visa Inc., ACI Worldwide, Inc., Square, Inc., Mastercard Incorporated., Fidelity National Information Services, Inc., Fiserv, Inc., and PayPal Holdings, Inc., are some of the key companies currently functional in the global remote mobile payment market.